The iPod is becoming the American Express you currently have in your back pocket or purse. You never leave home without it, and this is a perfect example. Apparently it doesn't matter who you are, where you are or what language you speak...Apple has a product for you. This dude's in the middle of an African desert surrounded by nothing with an AK47 in hand and a lip the size of Jamaica, but things must not be too bad because he still has time for his music. It would be funny to see this guy getting ready before he walks out the door to go to work. 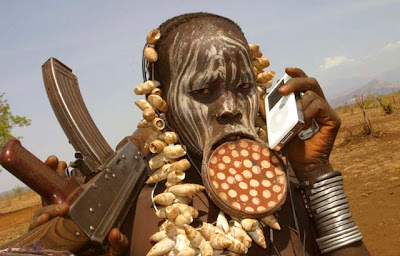 "Let's see here ok; wallet, check...ak47, check...new conch shell necklace, check...new over-sized lip saucer, oh-yeah perfect, check...oops, almost forgot the iPod. Man, that would have been a long walk back to the village..."